In today’s corporate world one of the key factors that determines today’s company value and tomorrow’s future is the people that runs the organization. 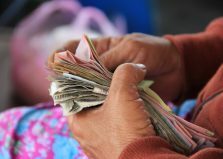 Research shows that staff members are not only motivated by the financial remuneration provided but also engagement and how the staff members are valued within the organization. 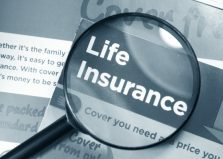 Therefore, life insurance benefits has now become a key component of the overall benefit for completeness of a scientifically derived remuneration package to staff members. The only certainty in life is uncertainty and it’s of paramount importance to ensure that if these uncertainties or risks cannot be eradicated then the impact is minimized. Sickness, accident, or untimely death can pose a great loss to the company but it’s the family that has to suffer the consequence of a loved one and also the financial strain as the staff member may be the only bread winner. In such cases, the company can face severe dilemma as although the company may wish to provide some support it may not be in line with company policy to do so although it may possess the financial capability to do so. 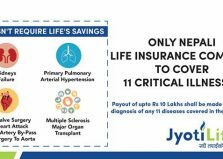 Considering all these facts, Jyoti Life Insurance Company is proud to present “Group Term Life Insurance Plan” which is a complete, comprehensive and cost effective package for assurance of your staff against Death, Accident, Disability and Illness. 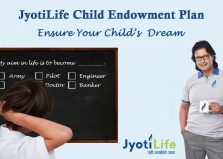 This allows the company to completely shift the liability to JyotiLife at a nominal fee. In the event of death due to any cause of any employee anywhere in the world, death benefit amount is payable to his/her beneficiary. Also, additional benefit equivalent to 10% of the Basic Sum Assured or NRs. 200,000, whichever is lower, shall be payable as Funeral Benefit. In case of death of Insured Employee due to accident, within 183 days from the date of accident, the additional accidental death benefit sum assured will be payable to such Insured Person less any other amount paid or payable for Dismemberment, Loss of Sight, Hearing, Speech Benefit and Permanent Total Disability. If an Injury results in any of the following losses to the Insured Person within 183 days after the date of the accident, the Company will pay in one lump sum the applicable percentage. Terms and conditions apply. 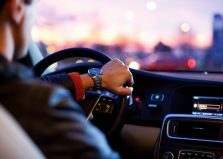 If, as the result of a covered Injury, and commencing within thirty (30) days after the date of the accident, the Insured Person suffers Temporary Total Disability and remains so continuously for a period in excess of the Elimination Period of 1 week. The sum assured of this benefit will be paid periodically as Weekly Accident Indemnity to such Insured Employee beginning with the first day following such Elimination Period (if any), for the continuous duration of Temporary Total Disability, but not to exceed the maximum period of fifty two (52) weeks. If, as a result of a covered Injury, and commencing within thirty (30) days after the date of the Injury, an Insured Person shall require treatment by a registered Physician / Nurse / License Pharmacist , or being confined in a registered Hospital, or the employment of a licensed or graduate nurse while at the Hospital. The Company will pay the Reasonable, Customary and Necessary medical expenses incurred within fifty two (52) weeks from the date of the accident not exceeding the maximum limit of NRP 200,000 as the result of any one accident. If the Insured Person is diagnosed to be suffering from any of 15 Critical Illness as mentioned below, the Insurance Company shall pay the amount for which the Insured Person is insured under this benefit up to maximum Rs. 10,00,000. A claim payment under this benefit will reduce the death benefit sum assured by an amount equal to the claim payment under this benefit. 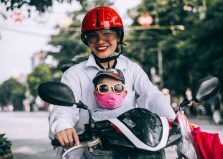 To be eligible for group cover, a prospective group must be a corporation or cooperative association, registered according to the relevant laws of Nepal. There must be employer employee relationship in the group. Group must have minimum 10 employees. Eligible employee must be full time actively working at the time of insurance commencement. Request for Group Proposal, to be filled by the Employer. Company Profile Form, to be filled by the Employer. Enrollment Form, to be filled by each employee at the time of Policy Commencement. If coverage amount exceed Free Coverage Limit. If minimum participation of 75% of eligible employees are not enrolled. Medical Tests Requirement if Sum Assured exceeds Free Coverage Limit and as per Medical Requirement Chart.